One of the most noticeable differences between Linux and Windows is the directory structure. Not only is the format different, but the logic of where to find things is different. You'll notice that the slashes are forward slashes in Linux versus backslashes in Windows. Also, there is no drive name (C:, D:, etc.) in Linux. At boot, the ‘root partition' is mounted at /. All files, folders, devices and drives are mounted under /. Though it is not apparent from this example, it is important to note that files and folders in Linux are case sensitive. /Folder/subfolder/file.txt is not the same as /folder/subfolder/file.txt. The Linux Directory Structure follows the "Filesystem Hierarchy Structure (FHS)" maintained by the Free Standards Group although most of the distributions sometimes tend to deviate from the standards. The Directory Structure starts with the Root file system "/" and is indeed the root directory for the whole structure.The partition where / (the root directory) will be located on a UNIX or UNIX-compatible system. This contains the Kernel, Firmware and system related files. Contains the essential binaries for users and those utilities that are required in single user mode. Examples, include cat, ls, cp etc. The /dev directory contains the essential system files and drivers. The /etc/directory contain essential System configuration files including /etc/hosts, /etc/resolv.conf, nsswitch.conf, defaults and network configuration files. These are mostly host specific system and application configuration files. All the user home directories are held under this directory with the exception of the root home directory which is kept under /root directory. This directory holds users files, personal settings like .profile etc. A generic mount point for temporary file systems. This comes handy particulary when troubleshooting from CDROM etc wherein you might have to mount the Root file system and edit configurations. Contains Non-Essential Non-critical command binaries for users. Library files for the binaries in /usr/bin & /usr/sbin directory. The /var directory is mostly mounted as a separate filesystem under the root where in all the variable content like logs, spool files for printers, crontab,at jobs, mail, running process, lock files etc. Care has to be taken in planning this file system and maintenance as this can fill up pretty quickly and when the FileSystem is full can cause system and application operational issues. A temporary file system which hold temporary files which are cleared at system reboot. There is also a /var/tmp directory which holds temporary files too. the only difference between the two is that /var/tmp directory holds files that are protected at system reboot. In other words, /var/tmp files are not flushed upon a reboot. Then you have the virtual (psuedo) file system /proc which resides in the memory and is mounted under the Root holding kernel and process stats in text file formats. 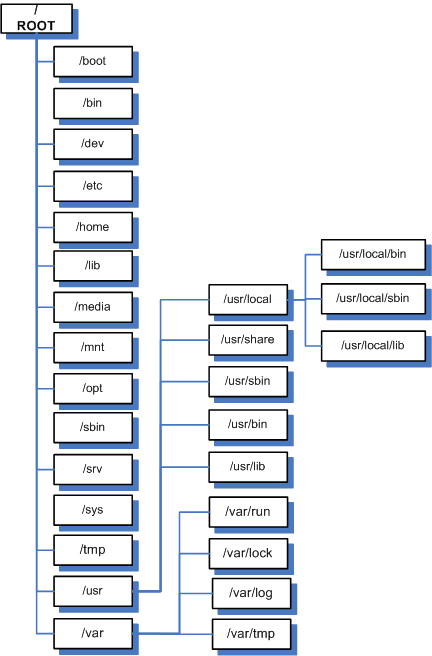 This structure could vary from distro to distro and this is a very generic linux directory structure.The directory structure in Linux can be confusing for new users of Linux. Most distributions have the same general structure of the base directory system. The wording of the this piece is not good — extensive editing is in order. In particular, the descriptions of /dev and /sys are downright misleading. /dev contains device nodes, not device drivers (which may be linked into the kernel image or reside in separate files under /lib/modules). /sys contains machine-readable textual descriptions or kernel objects, such as modules, devices, buses etc. GNU/Linux is not case sensitive; some filesystems it supports are. You can install GNU/Linux on a FAT32 partition, and it won’t have any case sensitivity. I agree the descriptions of dev and sys are atrocious; it’s a nice newbie explanation tho (nice diagram too;) Yes it should be corrected. “Also found here are the include directory with include files” er whut? “A temporary file system which hold temporary files” hmm. Very Good tutorials for new user. I want create partions for each director.I know that 100Mb more than enough to /boot directory. Anyone has idea about how much space distribute for each directory in the file hierarchy. any chance the directories could be called something meaningful like binaries or programs, settings, etc? Or does the kernel have a limited vocabulary? I have installed a “Ubuntu” desktop, and I am unabe to connect via ssh remotely. Can you check for the ssh daemon, if not running kindly install ssh and check it should be working. I guess your problem is sorted. I agree with one other poster about the directory naming in linux. Whoever thought of that directory naming convention should be punched in the nuts hard and often! I think this was a decent primer for us new people. Something like this really needs to be done in much more depth though, but it’s good nonetheless. In my opinion this file structure is seriously messed up because of the lack of a common rigid standard and developers/distros choose to put their binaries and configuration files all over the place. I use Ubuntu on my main PC for over 4 years and I use FreeBSD and Debian/Ubuntu servers in production. Every time I need a specific config change I need to search for the binaries and configuration files. Compiling and installing drivers from the source is my worst nightmare. Linux file structure definitely needs a major rework. Thanks for the primer, flaming excepted. Concur with commenter annoyance about not getting an introduction to directory system when installing Linux. I still do not understand “nodes” , or where to find my hard drives. When I install new programs in Ubuntu, where are they installed? In /bin? In reply to Rob, he probably doesn’t realize that these directory names originated in UNIX from the beginning, when the normal user terminal was a Model 10 Teletype. Rob should have to use one of those for all his work for a few months (like I did), then he’d be a lot more sympathetic to the guys who created the original names. I like this post. I don’t think that he had made any wrong article. Because there are thousands of Linux distros are there. and obvious that there are many many improvement in every old version. So directory structure might be not same in every distributions. It is just a basic structure which is probably defined by Mr.Linus Torvald. do you have any a document about Linux? please shared to me, ok.